A children's book about a young pelican’s journey to find the perfect home. Johnette Downing stays true to her Louisiana roots in "Petit Pierre and the Floating Marsh". to bring the story to life. 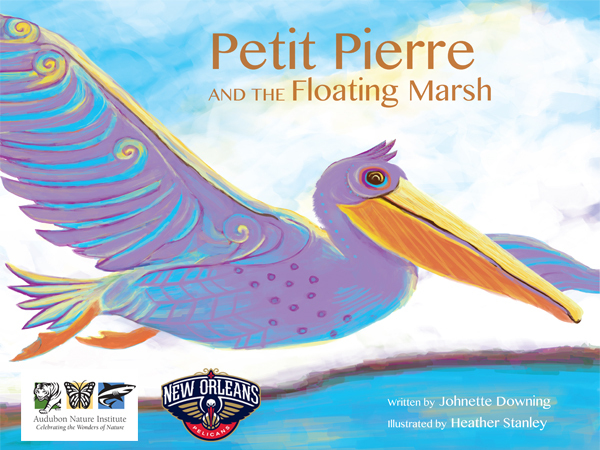 Proceeds from "Petit Pierre and the Floating Marsh" support wetland education initiatives throughout south Louisiana. Petit Pierre and the Floating Marsh was created through a partnership with Audubon Nature Institute and the New Orleans Pelicans. With this heartwarming story about a pelican and his wetland friends, Audubon and the Pelicans hope to encourage reading and connect children with the beauty and importance of Louisiana’s wetlands. 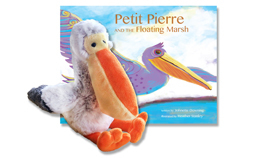 Proceeds from Petit Pierre and the Floating Marsh support wetland education initiatives. Hailed as the “Pied Piper of Louisiana Music Traditions” and the “Musical Ambassador to Children,” Johnette Downing is dedicated to sharing her Louisiana roots music and books with children across the globe. 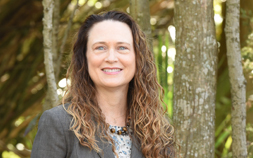 The author of eighteen picture books, two board books, and ten recordings, Johnette has received twenty-two international awards and has performed word-wide. Heather Stanley is an illustrator and graphic designer whose artwork ranges from hand drawn pictures to digital compositions. Raised in southern Louisiana she earned a BFA in Advertising and Design from the University of Louisiana at Lafayette and an MFA in Illustration and Design from Radford University in Virginia. 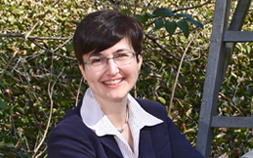 Heather is currently the Director of Creative Services at Audubon Nature Institute managing an innovative team for both graphic and website design. Petit Pierre and the Floating Marsh was listed as one of the top ten "Books for giving: A New Orleans reader's wish list" by the New Orleans Advocate. This children's book was selected to represent the state of Louisiana at the 2016 National Book Festival in Washington, DC. Audubon Nature Institute has donated two Petit Pierre books to every library in the state of Louisiana! Foreword Review Magazine: "Petit Pierre and the Floating Marsh is a fascinating book with two distinct strengths. The first is the story of Petit Pierre, a young pelican who must leave his mother's nest and find a new home. The second is told across the bottom of each page through facts about the Louisiana wetlands and the animals that make their home there. The book includes vibrant, lovely illustrations that support both the story of Pierre and the information about the wetlands. Though written for children ages five to nine, this book is appropriate for anyone who would like to learn about this unique ecosystem." Synopsis: Petit Pierre does not want to leave the pelican nest, but through friends and family he learns that home is not that far away. Conservation: Petit Pierre and the Floating Marsh was created through a partnership with Audubon Nature Institute and the New Orleans Pelicans. With this heartwarming story about a pelican and his wetland friends, Audubon and the Pelicans hope to encourage reading and connect children with the beauty and importance of Louisiana’s wetlands. Proceeds: Proceeds from Petit Pierre and the Floating Marsh support wetland education initiatives. Audubon Zoo gift shops carry an adorable plush pelican to accompany the book! Super soft and extra cuddly kids love to hold this stuffed animal and listen to the story. Look for the Petit Pierre display at the Zoo's Audubon Marketplace and at the Aquarium's main gift shop on the first floor. As our wetlands vanish so do our animals, industry and storm protection. Learn more about the Louisiana Wetlands through Audubon Nature Institute's wetlands page.